When we were building our home we rented a farmhouse during the 18 month process. 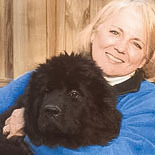 It was on one of a number of farms owned at the time by John Kluge. Shortly before we moved into our new house, and while we were still renting, he donated all his farms and the thousands of gorgeous productive acreage to UVA (sad move). UVA immediately sold the one we were on to investors. One morning they came by, and beginning at the main house, began emptying the basement into a construction dumpster! 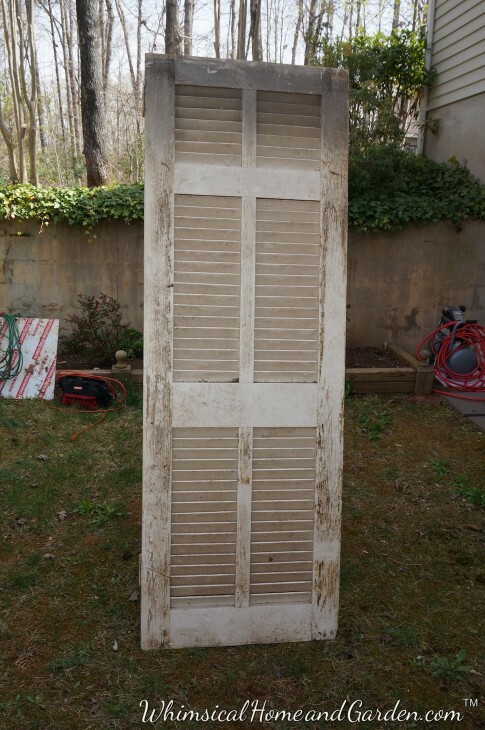 In that pile were these two shutters, and they gladly let me have them before hauling everything else to the dump. 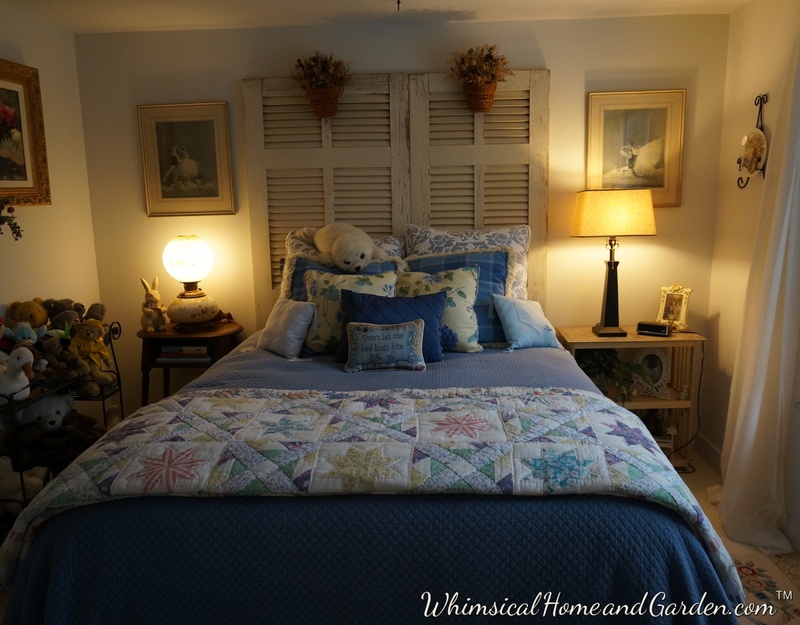 We eventually moved them to the new house with us and I ended up forgetting all about them for a long time, even though I had thought I wanted to use them either in a garden house or in one of the guest bedrooms as a headboard. So here is a post on the metamorphosis of a pair of very old shutters. They were mighty grungy, but were solid and heavy as heck. You can see the pressure tank in the background. I used the pressurized air to blow the dirt out of the crevices. I washed them first using oxi-clean dissolved in water. I scrubbed with a brush after I let the solution sit for a few minutes. I then used the hose to rinse, then blew the water off quickly with the air hose. I then sanded and sanded. The paint job on these shutters was amazing! It was brutal to sand off. I would have preferred more bare wood, but there ended up enough that I was satisfied. This room was a nursery first. Then it was empty for a while, then made into another guest bedroom. Although it is the smallest bedroom, it still manages a queen sized bed, lots of space at the end of the bed. There, there is also a very large walk in closet. 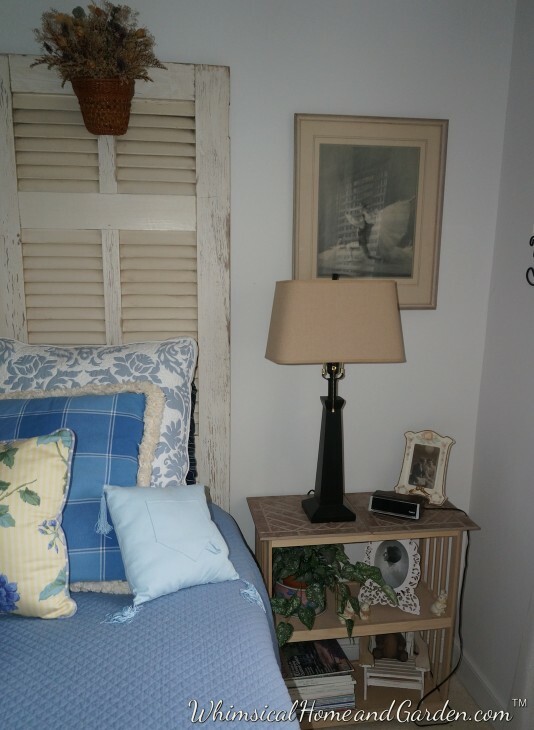 The shutters are just what the room needs for now. I was going to make an upholstered headboard, but why, when I could repurpose these? 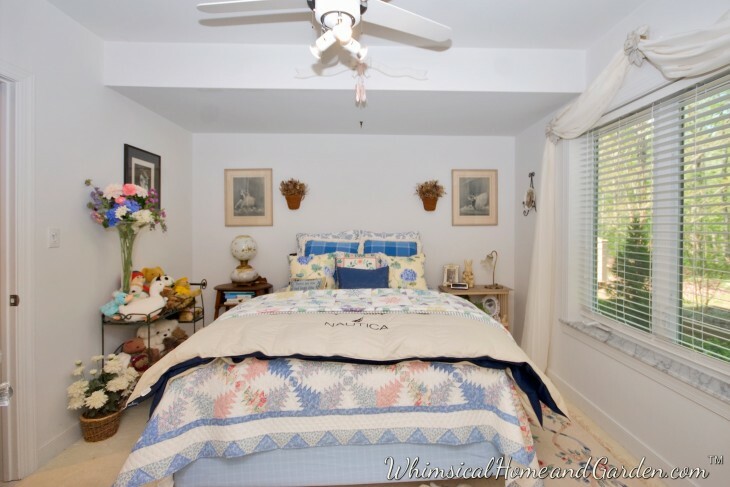 The bedroom is a bit feminine, but there are two other guest rooms that are not. 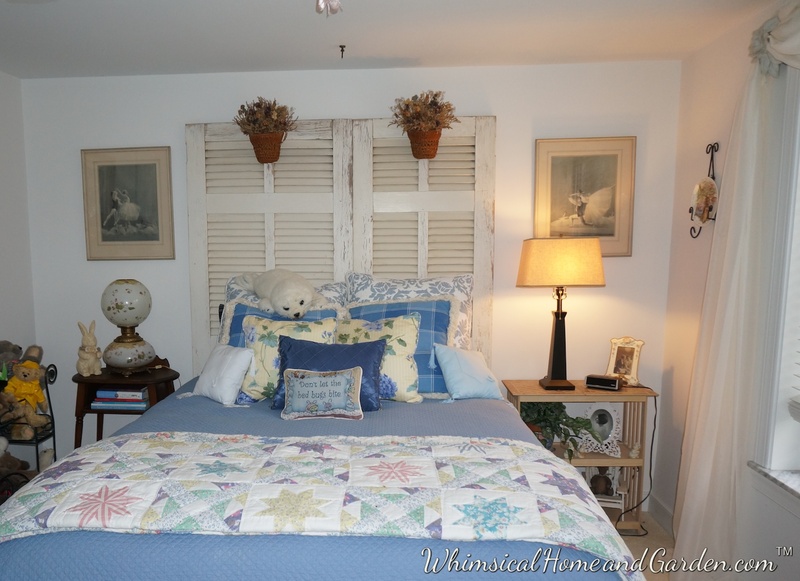 In this bedroom I used all the odds and ends from my last home that never found a place in this house. Eventually I would like to paint the shutters a French blue, but the original paint is fine for now. 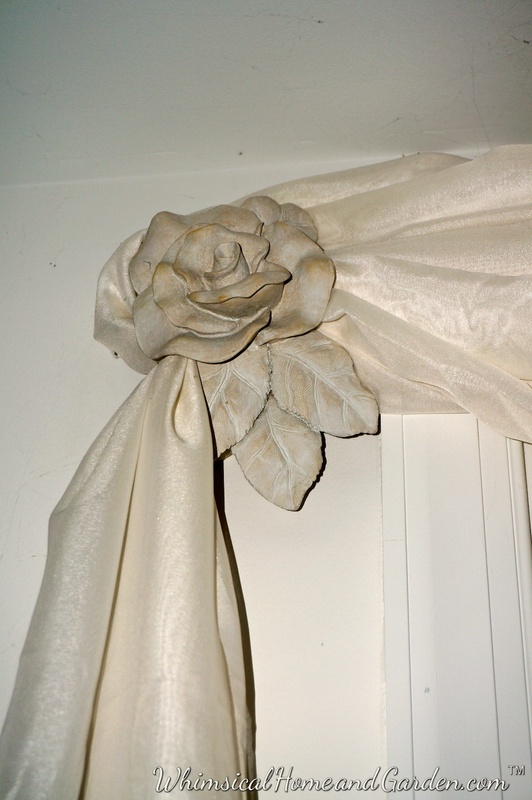 Detail of the rosettes for the window treatment in above photo. 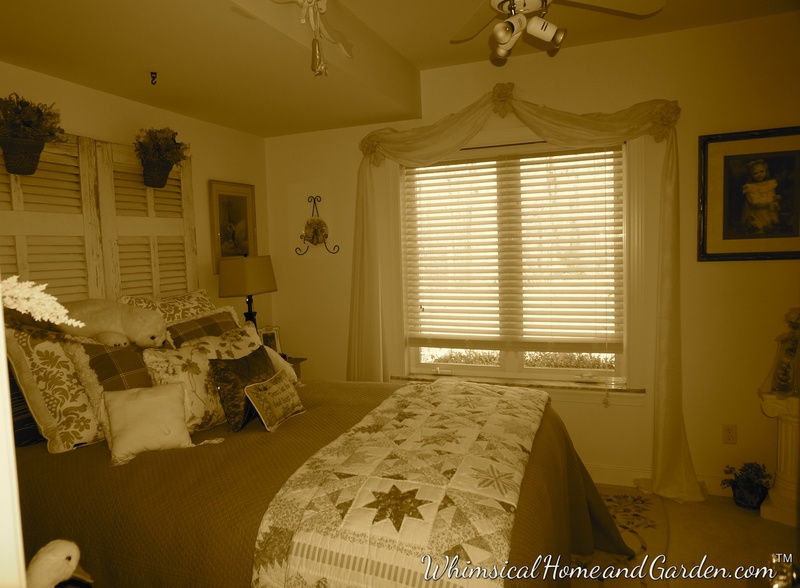 They looked pretty when the room was a nursery, so I kept them and added the wood blinds several years ago. Not sure why I didn’t turn on the other lamp when I took the photo-oh well. Notice anything ?? The shutters are two different sizes. One is 3 inches wider. Hanging the baskets on the shutters that before, had been on the wall helps to lessen the size difference. 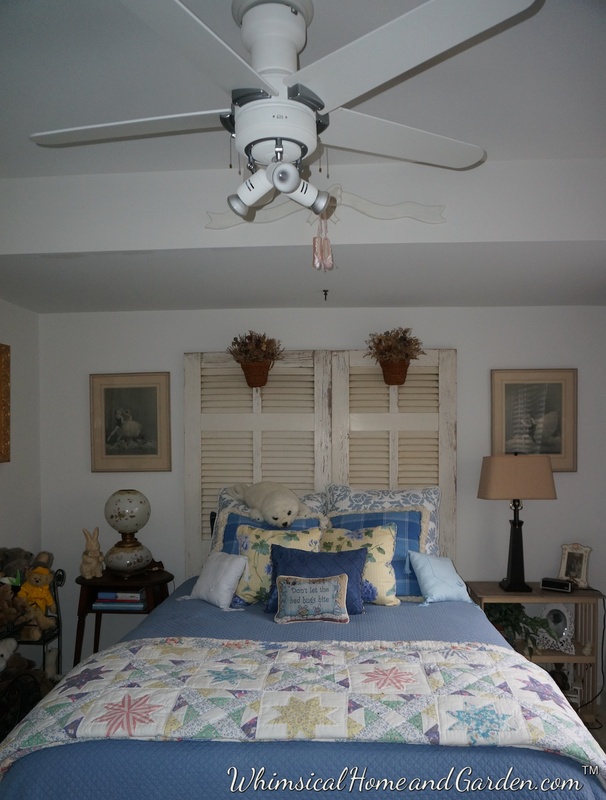 The ceilings in this bedroom are almost 9 feet, but you can see a soffit behind the ceiling fan and over the bed. The mattress is on a bed frame that allows a headboard to be attached. I choose to slide the shutters behind the bed, and they are really sturdy there without attaching, in large part because the bed in high, and hold it in place. Also, there is a hanging wood bow with toe shoes on the soffit wall. This is a closeup of the mini tow shoes that hang from a wooden bow on the soffit. 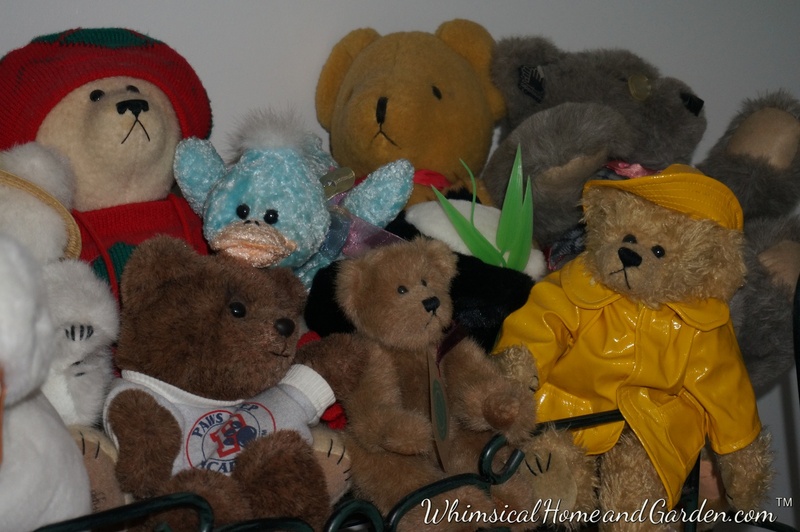 As I mentioned, this room was a nursery, so there were bears (and one duck), lots and lots of bears! I donated many but these faces all said “keep me”. 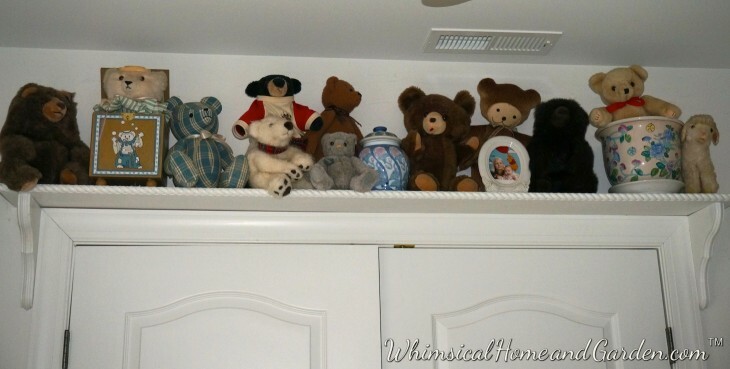 Over the double doors of the closet are a few more, including the worlds ugliest bear (the one with the red & white shirt on). I used some wood rope molding to finish the shelf edge. The lamp on the right was mine when I was a baby. 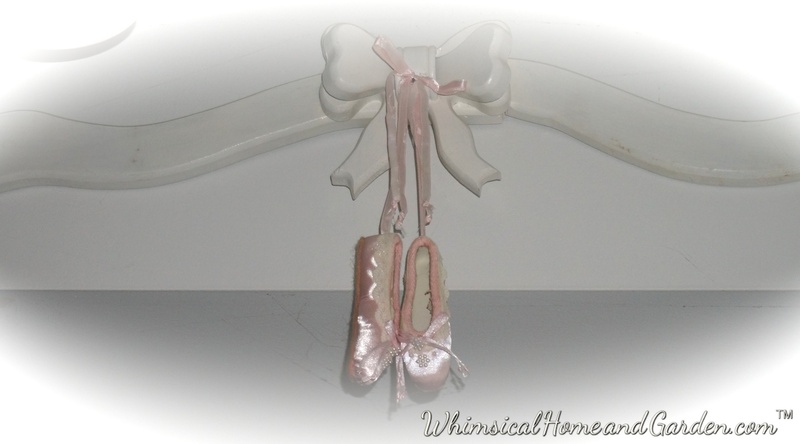 The framed dance art work, one on each side of the bed, I inherited, and are two of my favorite pieces of art. The harp seal on the pillows is actually a puppet. Special memories attached, so it stays. When we were building our home we rented a farmhouse during the process. It was one of a number of farms owned at the time by John Kluge. Shortly before we moved into the new house, he donated all his farms and the thousands of gorgeous productive acreage to UVA. UVA immediately sold the one we were on to investors. One day they came and beginning at the main house began emptying the damp basement into a construction dumpster! 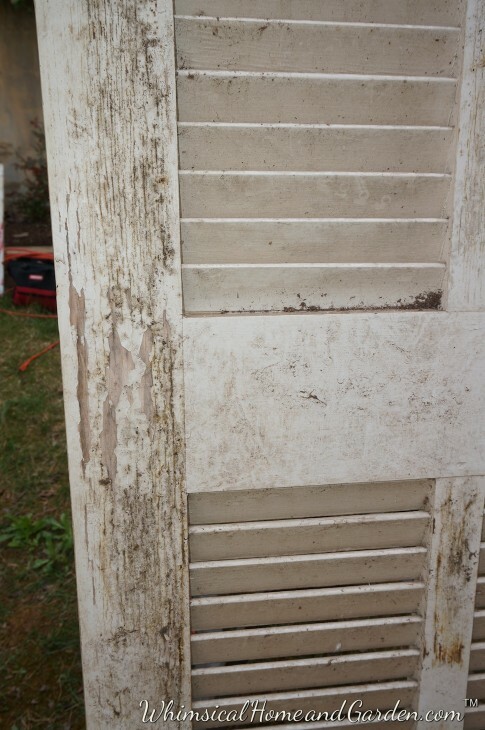 In that pile were these two shutters, and they gladly let me have before hauling everything else to the dump. We moved them to the new house with us and I ended up forgetting all about them for a long time. 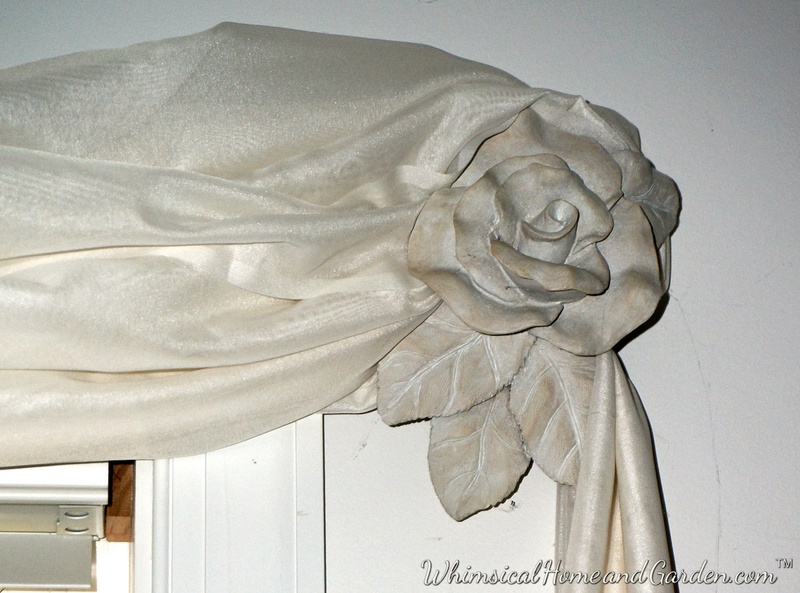 I knew I wanted to use them either in the garden house or in one of the guest bedrooms as a headboard. 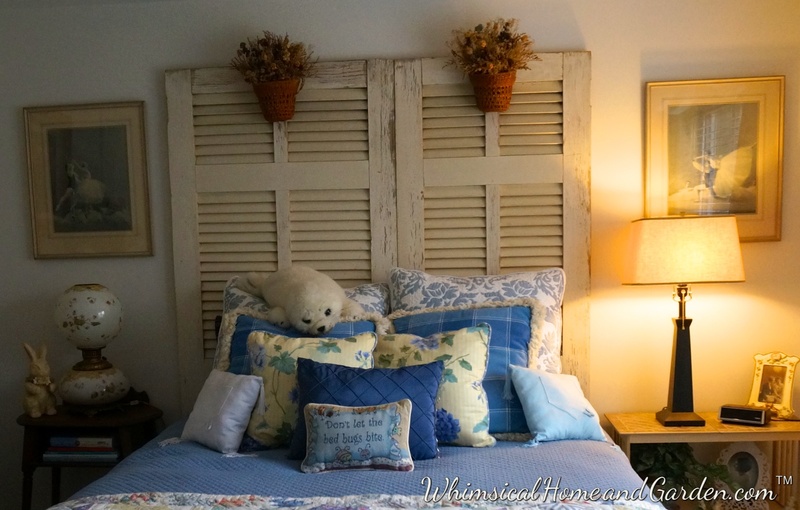 So here is a post on the metamorphosis of a pair of very old shutters. Sometimes I will sleep in this bedroom. It is cozy, and the mattress is so very comfortable. The quilt is an antique. I am constantly amazed at the creativity I find online. I read the title and thought the shutters were going outside! Great job. Thank you Margaret for the sweet comment. Some times I feel like I am talking to the wind, so it is nice to hear that readers enjoy the posts. As a young blog I am still feeling my way around, especially with the tech issues that can interrupt your progress at the most inopportune moments. I hope you were not affected by the storms. Fortunately, although we got more than 5 inches of rain the last couple of days, no tornados! Thanks again for writing. Oh, I love this room. 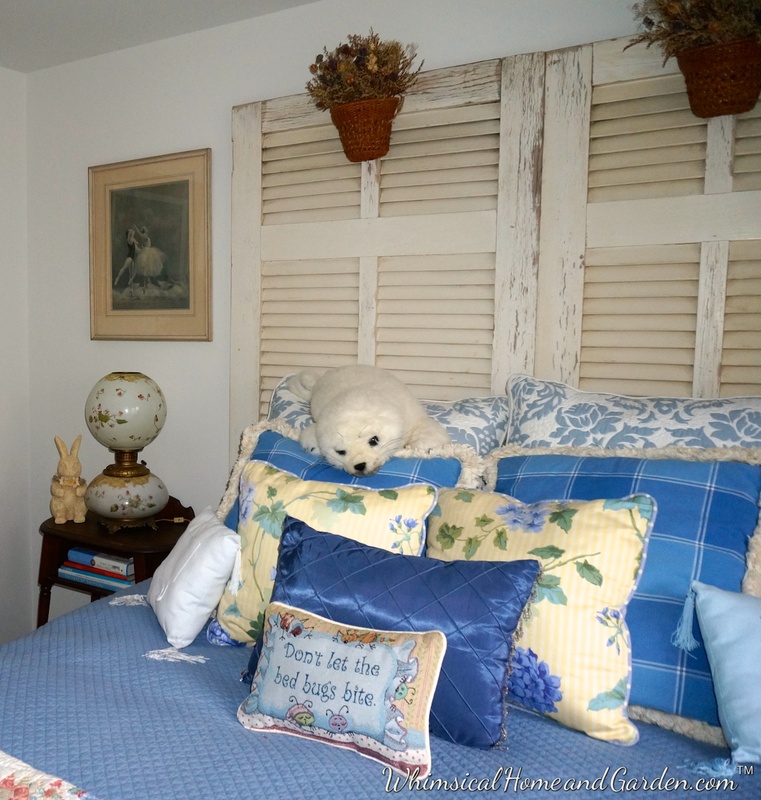 The yellow pillows are beautiful on that bed along with the blue and whites. I have always loved quilts. The seal brings such personality too. I am a big fan of stuffed animals. The shutters are perfect there. What a great idea! The room is so beautifully decorated! Thanks. This room is the sum of all the leftovers, but for now I am happy with it.